Performers include: Anthony Clark, Hedy Burress, Traylor Howard, Vincent Ventresca, Tasha Smith, Steve Paymer, Leah Lail, Robin Duke, Sam Anderson, D. C. Douglas, Zach Galifianakis, and Margot Kidder. 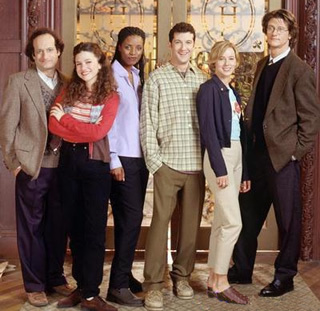 This sitcom centers around the events at fictional Randolph Harrington College in Boston, Massachusetts. It’s based on Boston’s Emerson College which series creators Max Mutchnick and David Kohan attended. The story begins as Boyd “Bo” Pritchett (Anthony Clark), a downhome nice guy, drives his sister Wyleen (Hedy Burress) to college from their small town in Virginia. She’s looking forward to finally being free of her family and starting a new life at college. The trip becomes much longer than either had expected. While in Boston, Bo meets and falls for Joy Byrnes (Traylor Howard), a ditzy grad student. He decides to stick around, getting a job as a handyman at the Student Union. Bo’s decision to stay is a shock, especially when Wyleen learns that Bo intends to share her apartment so that he can keep a big brother eye on her. Her plans to live big city college life to the fullest are quickly derailed while charming Bo tries to inspire his sister to appreciate the simple things in life. Joy already has a boyfriend, a self-involved college professor named Jack Pieed (Vincent Ventresca), but Bo finds ways to insert himself into her life anyway. Leonard Prince (Steve Paymer) is a student activist with a dour attitude. He hangs out at the Pritchett apartment and falls for Cookie de Varen (Margot Kidder). Meanwhile, Tasha King (Tasha Smith) is the college’s administrative assistant with a bad attitude, working for Dean Harrison Cross (Roger Rees). Cross gets on Tasha for disciplining the son of a major college benefactor. Wyleen tells Bo that it’s time for him to move out. He looks for a place to stay and winds up with Tasha. Cross “asks” Bo to get Tasha to be nicer to students but it’s a challenge for her. Joy is hired by Cross as a professor in Jack’s department. While Wyleen tries living on her own, Leonard tries to ask Cookie to marry him. First aired: April 27, 1997.